Buy the Farm . 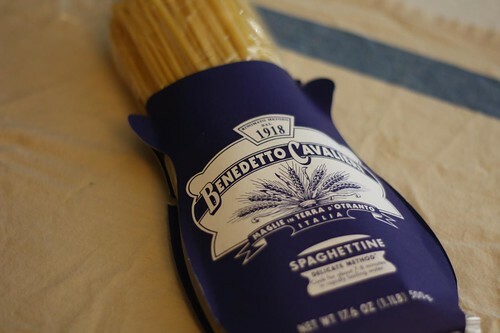 . . Share: Buttered Noodles, Roman Style! The other night Jen and I went to a really nice restaurant and had a fantastic meal. We both felt compelled to order what they were calling Spaghetti, Roman-Style. 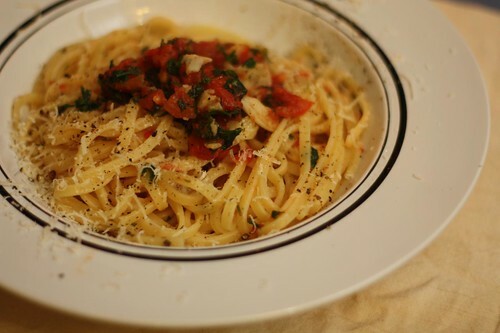 It was simple: spaghetti cooked with butter, garlic, and Parmigiano. Sometimes that just hits the spot. However, we couldn't bring ourselves to order it much for the same reason I never order the chicken entree at a restaurant. I don't think I'd forgive myself if I used up this experience to order what essentially amounted to buttered noodles. Besides the price tag was $25. For an extra $5 you could get the seared ahi tuna entree. The owner of that restaurant must get text alerts on his phone sent to him whenever anyone orders the Spaghetti, Roman-Style. I can imagine him smiling as receives the text, lighting a cigar with a $100 bill and telling his mistress, "One entree closer to getting that new gold-plated helicopter." Jen always refers to this dish as "buttered noodles." This is why she is not a successful restaurateur. She could only get $12 at the most with a dish of that name. This also happens to be one of Jen's favorite meals in the entire world. Since we weren't able to have it at the restaurant we had been craving this dish ever since Friday night. Tonight I decided to give in to that craving. I had also given into this craving last night by making cappelini with olive oil, butter, crushed garlic, fried parsley, cappelini, salt, and pepper. It was such a hit I decided to do the same tonight replacing the cappelini with this spaghettine. While the pasta was cooking I crushed the garlic, cooked it in butter and olive oil, threw in the parsley to fry it. I really kicked this dish up a notch by adding some tomatoes that I'd peeled and seeded. This is just another example of my culinary ingenuity. Tomatoes with pasta! How do I come up with this stuff? 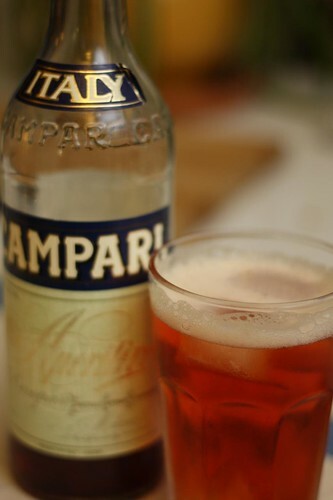 Given the fake Roman nature of our meal I decided to start us off with a refreshing Campari and soda. Having never been to Rome I just assume this is the kind of thing they drink before they have their Roman style spaghetti. When in Rome! Maybe! I imagine! For wine I really killed the mood by introducing a wine from Napa Valley. I'm sure I should have served a nice Montepulciano or Sangiovese but that is so trite. Besides I didn't have any of either of those. 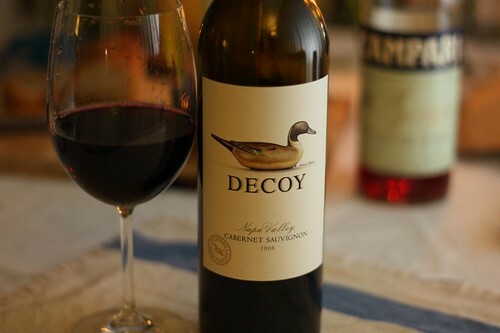 I did have this lovely cabernet sauvignon from Decoy Wines that some lovely soul had given me for Christmas this past year. It may not have been Italian but it did have a handsome mallard on it and it was was fantastic. Truth be told I would have liked the wine even if it wasn't very good just for the mallard. It reminds me of a painted wooden mallard my mother had when I was a young child. The mallard has always been a favorite duck of mine for that reason. It always reminds me of home and of youth. Although I may just be imagining the part about the wooden mallard.